Background: To make a prediction, we take information that we have now, and try to identify likely outcomes in the future based on this information. The model we've created expresses our uncertainty as a probability distribution over the likely outcomes of the election that are consistent with the information we have now. We call this distribution over outcomes the predictive distribution. Simulating from this model and plotting a histogram allows us to visualize the predictive distribution. When we say a model is correct, we mean that the predictive distribution matches the true distribution of election outcomes when the information leading up to the election matches the information that we have now. Usually, people are interested in having a single value as the prediction ("Obama will get 332 votes"). To obtain a prediction, we summarize the predictive distribution with a single point, usually by taking its expectation. 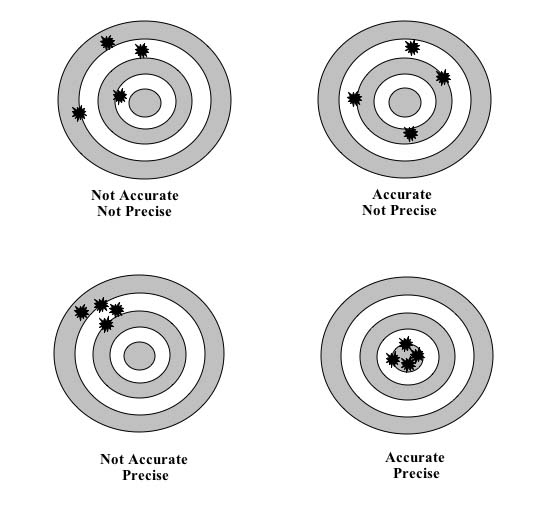 We can evaluate a prediction by its accuracy and precision. Answer: To evaluate the accuracy of our prediction, we can check to see whether the expectation of our predictive distribution seems to match the expectation of the true outcome. 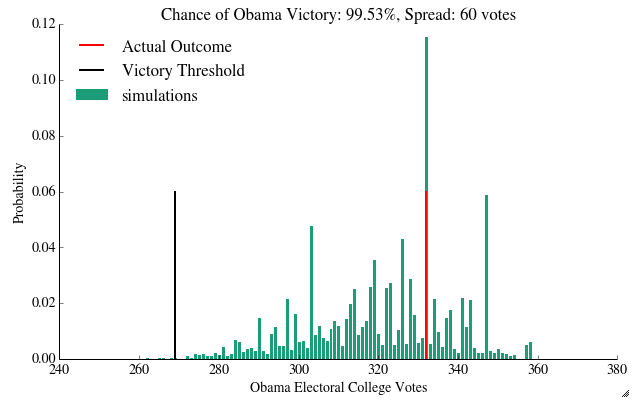 In this case, much of the predictive distribution's mass lies on or around the real outcome (that is, the histogram is approximately centered on the actual outcome of Obama=332 votes). So, based on the outcome we observed, the model seems accurate. To make a more rigorous statement about accuracy, we would want to have more replications (that is, more elections) to see whether the expectation of the predictive distribution consistently matches the true outcomes. To evaluate the precision of our prediction, we look at the spread of the histogram. Because we are assuming the model is correct, we can interpret the spread of the histogram as a measure of the variability among the election outcomes that are consistent with the information we have. If our current information does not constrain the likely election outcomes very much, then the difference between our prediction and the true outcome can vary widely. The spread of the histogram is 60 votes, which is relatively large. Whether the prediction is precise enough is a question of what you want to do with your prediction. For example, if you want to be able to call the winner of a close election (say the candidates are separated by less than 30 votes), this prediction would not be precise enough to identify a winner with 95% confidence. To handle this, we might wish to incorporate more information into the model to reduce the spread of likely election outcomes. Answer: The graph shows a hypothesis test. The histogram approximates the predictive distribution of election outcomes (in terms of electoral votes) assuming our model for the election is true. By comparing this to the true outcome of the election, we can see whether the observed electoral vote count would be highly atypical if the model were true. In this case, it appears the true outcome is quite typical among the model's predicted outcomes, so we do not reject our model. In this case, we have checked only one prediction, since there is only one true outcome that we've compared to the predictive distribution. To increase our confidence, we would want to test more outcomes against predictions that were made in the same way. For example, we could apply the same procedure (including PredictWise's computation of the statewise probability estimates) to different elections and see whether each of the hypothesis tests fails to reject the model in those cases as well. We could also break the election down into state-by-state outcomes, and test the prediction for each state against that state's outcome. Answer: We do not predict the exactly correct result (red line). According to the predictive model, the true outcome has probability 0. Thus, the evidence contradicts the predictive model, and we should reject it. Answer: The predictive distribution is consistent with the real data -- the real outcome seems like a typical outcome according to the model. The accuracy is not very good as the center of the distribution falls fairly far from the observed outcome, but the precision is only marginally worse than in the predictwise case. Answer The bias was roughly 8% in favor of the Democrats in the Gallup Poll, meaning that you would want to adjust predictions based on this poll down by that amount. This was the result of people in a number of Southern and Western states claiming to be affiliated as Democrats, then voting the other way. Or, since Gallup kept polling even after the elections, it could also represent people swept away by the 2008 election euphoria in those states. This is an illustration of why one needs to be carefull with polls. Answer: This was a disaster. The 8% calibration completey destroys the accuracy of our prediction in 2012. Our calibration made the assumptions that a) the bias in 2008 was the same as 2012, and b) the bias in each state was the same. There are several ways in which these assumptions may have been violated. Gallup may have changed their methodology to account for this bias already, leading to a different bias in 2012 from what there was in 2008. The state-by-state biases may have also been different -- voters in highly conservative states may have responded to polls differently from voters in libreral states, for instance. It might have been better to callibrate the bias on a state-wide or clustered basis. Note: The "your answer here" box was missing for this question. Answer: No. You should answer this question as though you had not yet seen the results of the 2012 election. The results from 2008 would suggest that the party affiliation poll is a highly biased predictor of the acutal election outcome. Given that calibrating the model to counteract this bias would rely on unrealistic assumptions, it would seem unwise to use the 2012 party affiliation poll to predict the election. Answer: There is a reasonably well fit line which hugs the x=y line. This tells us that the PVI seems relatively stable from election to election and may thus make a good predictor. Answer: Yes, it seems that with 3-4 misclassifications, we could draw a line to divide the data into two parts. Answer: The precision has worsened with respect to the predictwise (and even the gallup) model. The accuracy has improved with respect to the gallup model, but is not as good as in the predictwise model. Answer: The sharpness of the classifier boundary, as defined by the closeness of the contours near a probability of 0.5 gives us a sense of precision. Imagine that the boundary is very tight, tighter than what you can see in the graph. Then most states will be away from the 0.5 line, and the spread in the results will be less, or the precision higher. This is not the only consideration: indeed one must ask, how many states fall smack into the middle, say between 0.3 and 0.7. The more that do, the less precise the results will be, as there will be a greater number of simulations in which they will cross-over to another party. To assess accuracy, we would have to see the actual outcome of the states in 2012. Accuracy would be a function of the number of states that end up on the "wrong" side of the 0.5 line, and how deep they end up on the wrong side. In terms of characterizing the 2008 outcomes, it seems that the classifier is quit eaccurate, with most misclassifications appearing in grey area of the classification boundary. We are averaging many polls together, so some of their biases are likely to offset each other. One problem is that we treated all polls as equal. Thus a bad poll with a small sample size is given equal footing as a good poll with a large one. Thus we are introducing bias both due to individual poll biases and individual poll sampling errors. Furthermore, we estimate the standard deviation by simply taking the spread of the percentages in the polls, without considering their individual margins of error. In the limit of very limit sampling error per poll, this might be ok. However in states with some polls with large margins of error (Kansas, for eg), this can lead to an overestimate of the standard deviation, pushing the predicted probability toward 0.5. This, in turn, can hurt precision since it increases the chance that a state will flip sides in a simulation.